I want to uninstall a specific software program from my Windows Vista based computer. How this can be done? Re: What needs to be done for uninstalling a software program from Windows Vista operated computer? This is how you can safely uninstall programs from your Windows Vista computer. 1- First click on the start menu and go to contol panel. 2-then click on the "program and features " option in the control panel window. 3-After clicking it you should see a list of programs which are already installed in you computer. 4-Just select the program you want to uninstall and click "Uninstall/change" option which will appear on the top of the programs. 5-Then click OK and your program will be uninstalled. Now selected software program will be uninstalled. There are several ways by which you can uninstall program from your computer. several programs need restart of your system to uninstall completly from your system.because they were using dll files which are shared among the processes. you can uninstall the program from the control panel. now select the particular program to uninstall.If program prompts for restart then restart your computer. Windows vista is predecessor of the windows 7 platform. Most of us have moved on to the windows 7 platform but some of us still like to use the VISTA platform. In Control Panel window double click on the "Programs and Features" icon. A window will appear in which there will be the list of all installed applications. Select the program you want to uninstall and right click on it . You will get the option of uninstall or change .Click on uninstall to uninstall the application. 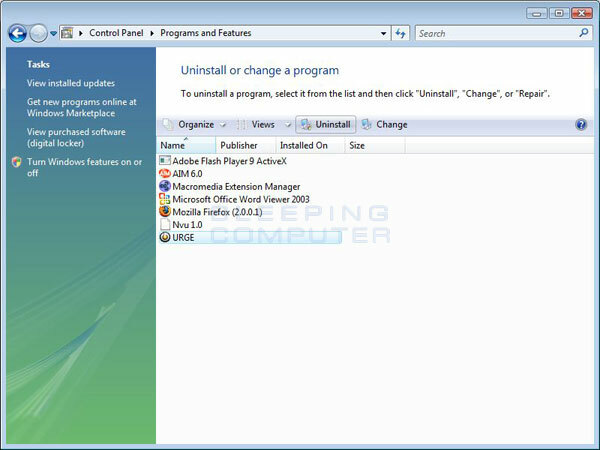 2) click on the "Programs and Features"
Now uninstall the software from your system.. If you get any problem you can use the Tune up Utility for uninstalling the software ..
2.Then you open the 'Control panel'. 3.Then you click on the option 'Uninstall a Program'. 4.Then a new window will open there you can find all the installed software's in your computer. 5.Make a click on the software which you want to uninstall. 6.Then you click 'Uninstall and continue the process. 1st-->open the computer by click the start button. 2nd-->select & open the option of control panel. 3rd-->press the option of the uninstall of a program on the device. 4th-->now install the software window is open . 5th-->press the uninstall & the process is continue. Now a window will display that list all programs that are currently installed on your pc . you can scroll and select the program you want to install. Now that we know what all the options in this screen do, lets start learning how to uninstall a program. The first step is look through the list of programs for the one that you would like to uninstall and then left-click on it once so that it becomes highlighted. Once you highlight a program you will see two new options next to the Organize and View button called Uninstall and Change. I have pointed those out with arrows in the image below. If you press the Change button, the program will launch it's setup so that you can modify how the program is presently installed. It is important to note that the Change button does not uninstall a program, but rather allows you to modify how it is currently installed. If you want to uninstall the program you should instead click on the Uninstall button. Once you click on the uninstall button you will be presented with a confirmation asking if you would like to continue as shown in image below. For those who like shortcuts, you could just double-click on an entry to start this process as well. For some programs when choose to uninstall it, Windows may prompt you with a message stating Windows needs your permission to continue. At this screen you should click on the Continue button. 3--Click on "Add or Remove Programs"
For uninstalling the software , you just follow the below mention steps. 1) Select the control panel. 2) In that select the " Programs and features " option. 3) Now you will display all the software which you installed in your computer. 4) Select the software which you want to uninstall it. 5) Right click on that selected software and choose uninstall . wait for some time till the software is uninstalled. After that it is recommended for you to restart the computer. 5.select program which you want to uninstall and press right click on it. 6.now click on uninstall option. 7. so your program will uninstall now. 1) Open control panel by clicking on the start button and then selecting Control panel . 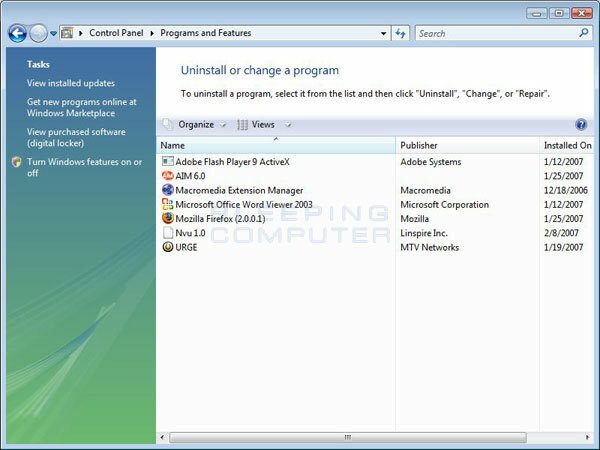 2) Click on the link " Uninstall a Program " below the option " Programs " . 3)Then right click the program(application) , that you want to uninstall , from the list of installed applications and select the option " Uninstall/change " . 4) After that duly perform the required uninstall steps that would be asked by the application to remove it from your system . 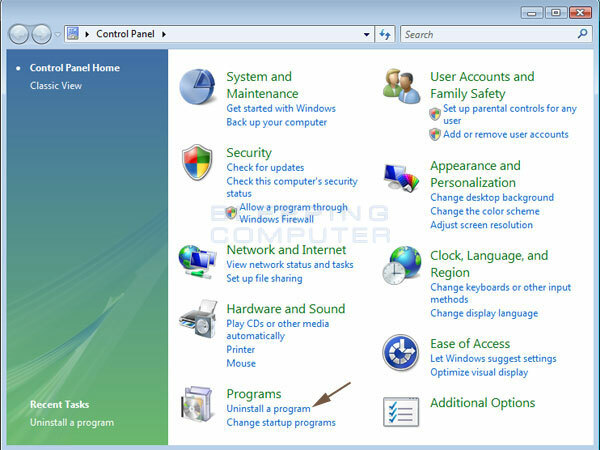 <> Choose to select on the "Start " menu and then Go to the " Control panel "
This is one way it is possible to easily remove applications from the Home windows Landscape computer. Now select the program which you want to uninstall and click OK. The program will be uninstalled. + First of all go to start button and open control panel in it. +Then Select "program and features"
+ Then click on "uninstall/change" button to remove the app. The process of uninstalling a software program from Windows Vista operated computer is very simple. You have to follow the following instructions to do the work for your PC. 1. First go to Start menu. 3. Now you have to fo to Program and Features. 5. From the program list uninstall the program of your choice. 6. The task is done. Go to Control panel from the Start button. Click On Program which you want un install..
Then click on un install button. After un install once restart the system. 1. First of all you should go to the Start menu button and click on that. 2. After that you should go to the option saying Control panel. 3. Then just go to the option of Programs. 4. From there click on Uninstall a program. 5. Then go to the program that you want to remove and double click on that. 6. After that give permissions to remove the program. That's it and the program will be removed from your computer.